The First International University Forum: The Value of Human Rights on the Camino de Santiago: Harnessing the power of tourism to promote cross-cultural dialogue and achieve the SDGs will be a space for reflection on human rights, sustainable development objectives and sustainable tourism. 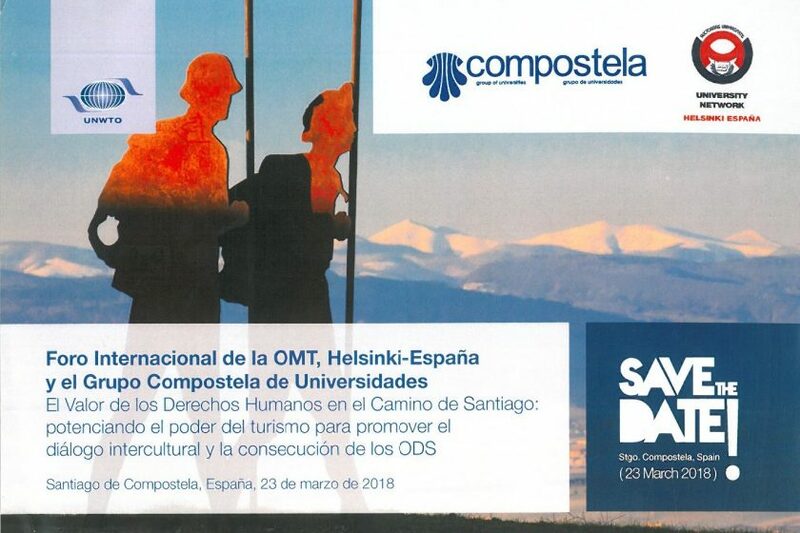 This forum is organised by the World Tourism Organization (UNWTO), the Compostela Group of Universities (CGU) and Helsinki España – Human Dimension. o Increment the knowledge and awareness of young people regarding Human Rights and Sustainable Development Goals (SDGs), through the spirit of the Camino de Santiago. o Promote the International Year of Sustainable Tourism for Development in its key areas: inclusive economic growth, employment and poverty reduction, resource efficiency, environmental protection and climate change, cultural values, diversity and heritage, mutual understanding, peace and security. o Increase the commitment of participating universities to work towards knowledge and application of the SDGs until 2030.
o Foster international cultural exchange, sustainable tourism and solidarity through mutual knowledge and volunteerism, promoting social inclusion, environmental protection and the reduction of poverty and social exclusion. The organising committee has selected 20 universities from Europe, America, Africa and Asia to complete the first two stages of the First International University Forum. 125 students and 20 professors will participate in the online training and walk the Camino de Santiago. In March, 20 rectors of these universities will join them at the First International University Forum: The Value of Human Rights on the Camino de Santiago: Harnessing the power of tourism to promote cross-cultural dialogue and achieve the SDGs in Santiago de Compostela.